The most vibrant of all print media, contemporary Metal Prints are an unexpected way to turn digital images into breathtaking works of art. 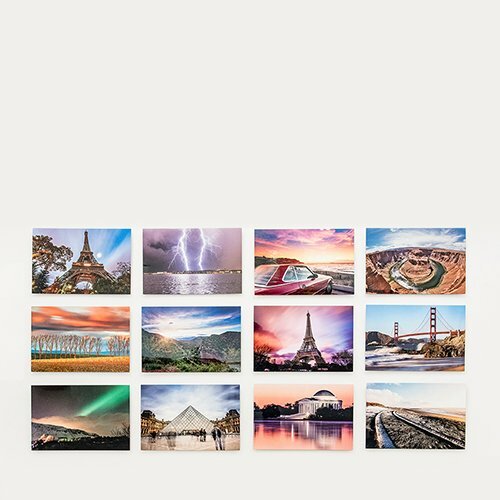 Metal Prints are available in 17 different sizes, from 4x4" to 24x36". Display options include a black shadow mount, an aluminum easel, a float mount hanger, and stainless steel Standoffs. All Metal Prints are 2mm thick and are finished with a protective white gloss. When designing your Metal Prints, please be sure all important content is located within the safe zone. There is a 1/8" bleed around standard-sized Metal Prints. CLICK HERE for more helpful design tips and templates. Each print is protected by a high-gloss UV, coating which keeps your image resistant to water and dust over time. 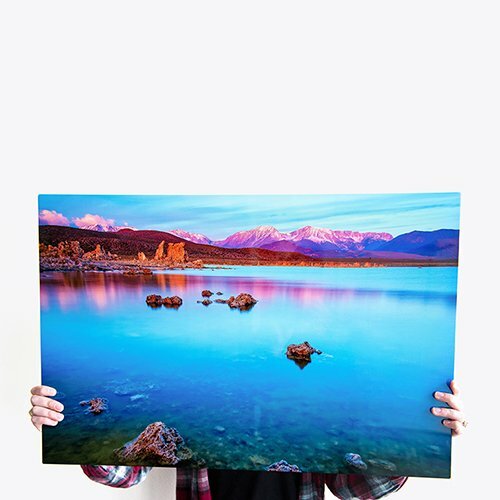 Expertly produced in one of the world's only photo labs to be G7 Color Certified, our Metal Prints have ultra-high definition colors, intense blacks, crisp contours, seamless gradations, and a unique, luminescent finish. If you'e looking for a photo option that is certain to turn heads, you can't go wrong with our metal photo prints. Vibrant and durable - and available with a range of printed decorative border options - metal photo prints need no frame, giving your photos a sleek and sophisticated profile whether they're hung on the wall or placed on an end table. Metal photo printing is a unique and attractive way to display your favorite images. Equally well-suited for portraits, landscapes and abstract images, metal prints allow your photo's vibrant colors to truly stand out. And you can choose the shape that best suits your image: clean lines and sharp corners to compliment your picture of the New York skyline, or soft curves and decorative edges to flatter the cuddly blanket and beautiful chubby cheeks in your grandbaby's portrait.